One of the most iconic bands to emerge in the inebriating puff of reggae was Black Uhuru, which began when Derrick “Duckie” Simpson combined forces with Garth Dennis and Don Carlos. Although it took until 1977 – five years after the birth of the band and after a few incarnations, including one featuring Sly Dunbar and Robbie Shakespeare – Mr Simpson has shepherded the group to make it one of the greatest musical outfits along with Bob Marley and The Wailers (with Bunny Livingston and Peter Tosh) and Burning Spear. Their music was quite unique; a collision of deep-seated African rhythms and the melodicism of indigenous and colonial influences with heavy overtones of the socialism that arose with People’s Nationalism of Norman and later Michael Manley and, of course, the spiritual allegiance to Ras Tafari. As it turns out Black Uhuru, probably the most Afro-centric of all of the great reggae groups, has not only survived the vagaries of mortality (musical and otherwise) with Derrick “Duckie” Simpson putting his stamp on the music of Black Uhuru from its earliest incarnations to this one with which he has made As The World Turns. The militancy of the earliest days of Black Uhuru is still very much in evidence and this is reflected in the lyrics that drive most of the music – especially that of “War Crime”, “Police & Thief” and “Slaughter”. However, the music also retains the mellifluousness that is intrinsic to the Rastafarian sensibility not the least because of the mellowness that enables him to “Fear no evil” as Mr Simpson sings in “Jah Guide”, and in “Jamaica Herbman” where “your heaven lives on” and in “Ganga Baby” where “the words of Rasta/Fling down/& hold a little joy/Under the sun”. Make no mistake however, with all of the rippling feel-good grooves, the rumbling bass and characteristic drum lines, this music by Black Uhuru is always on the right side of social justice. Thus it is music made in the classic mould made in the 1970’s when militant reggae was young. If anything it is more relevant today as the divide between the proverbial haves and the have-nots is every wider than it was when the British divested itself from the colonies in the greater and lesser Antilles. And although this may not be as obvious to white society “Never under estimate,” Mr Simpson warns “A dreadlocks with his slate” in one of the most memorable charts on this album – “Five Star General”. So, don’t expect empty reggae “riddim”. 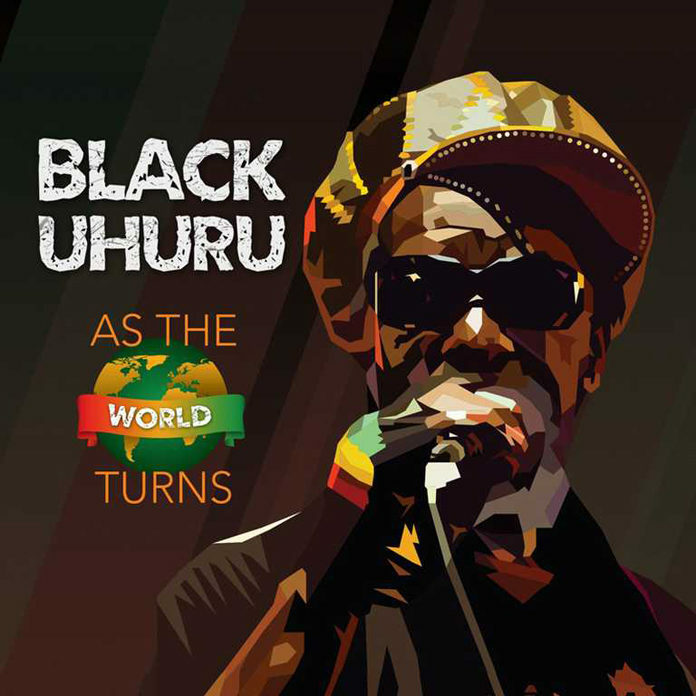 It’s all about words and music in the inimitable style of Black Uhuru on As the World Turns”. It’s just a pity that the overall sound (sometimes ferociously loud and at other times, mysteriously and distantly soft) isn’t more consistent.